The striped swallow is a bird which is found in Africa, but they are like swallows the world over. They are trim and streamlined, and they seem to be in motion even when at rest. Even though they seem delicate, they appear hard, almost as if they were sculpted out of metal. I especially like the tight little head. No matter where they live in the world, swallows, of course, feed on the wing. These striped swallows swooping over an African river reminded me of the cliff swallow I have seen darting after insects over some river in America. 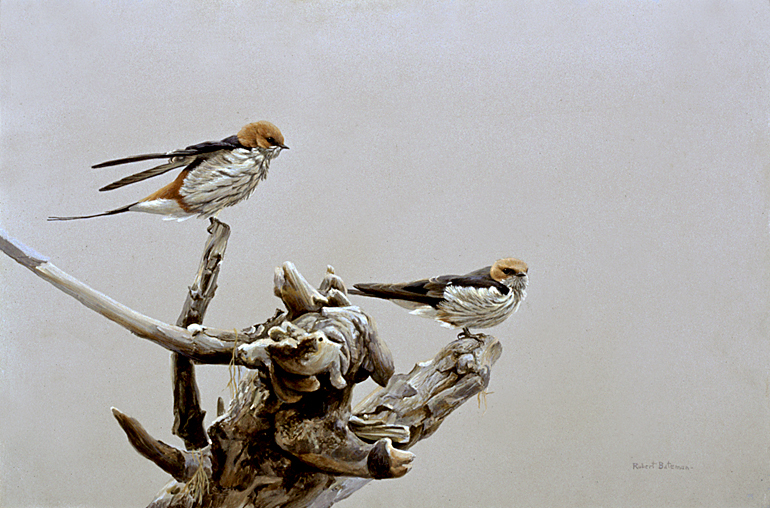 Indeed, the typical place to see striped swallows is near a river in dry savanna country. The clue to this location is in the painting. The wood on which the swallows are perched is water worn. This kind of country is normally dry but subject to sudden heavy rainstorms. The streambeds can fill with raging torrents which erode the banks and sweep away the uprooted trees.